It’s so hard to pick a short list of great plants to talk about in early summer, as everywhere you look there’s something worth mentioning, but here are just a handful of my favourites for now. 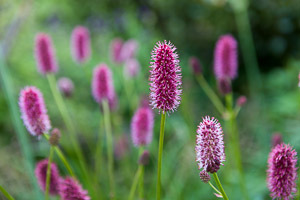 With neat, ground-hugging clumps of attractive foliage, this burnet is smaller than many other varieties of Sanguisorba, as it grows to just 30-40cm high. 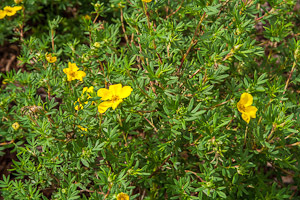 It’s an easy, compact perennial to grow on moisture-retentive soils in sun or partial shade, flowering from June onwards. 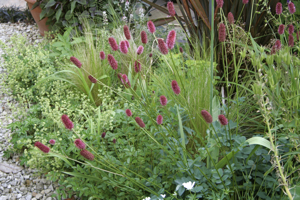 I like to use it as an edging plant as it’s so well-behaved and tidy, and the leaves are interesting too. Last year I added a few stems to bunches of mixed flowers I cut from the garden and I’m happy to report that they have quite a good vase life too. The small dark red bottlebrush flowers on sturdy stems fade to brown but they retain their shape & structure well into autumn so it’s one of those plants that is worth growing for its long period of interest. Yet to be tested by yours truly, but apparently the foliage is edible and tastes of cucumber! Whether that’s true or not, apparently this plant is ‘rabbit resistant’ but again, that’s something I haven’t tested and would welcome feedback on. There’s no doubt that dry shady areas of the garden are notoriously difficult to keep looking good. 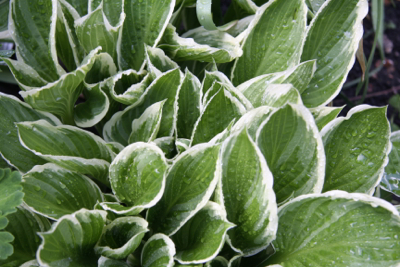 Plant choices are limited and it can be hard to find flowering interest beyond spring. That’s where Lamium maculatum comes in! 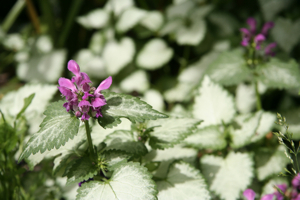 Commonly known as ‘dead nettle’ for fairly obvious reasons, this is a seriously useful plant if you’re looking for low spreading ground cover which offers both foliage interest and pretty flowers. Lamiums come with a variety of leaf pattern and degrees of variegation. I particularly like the white-flowering ‘White Nancy’ and pink-flowering ‘Beacon Silver’. 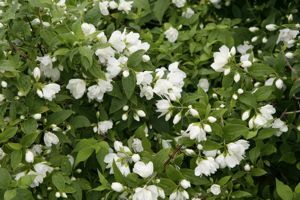 Growing to just 15 or 20cm in height but spreading 60cm or more, with silver and green heart-shaped leaves, they are ideal to brighten up gloomy areas under shrubs and trees. Lamium maculatum have semi-evergreen foliage, and prefer partial or full shade, are drought tolerant once established, great for suppressing weeds and will flower from May to July. All in all a really good value plant! Iris are a really useful family of late spring / early summer flowering plants which will grow in a wide variety of garden situations – as long as you choose the right variety for your soil conditions. Some Iris like to bake in hot dry borders, others like to grow in water – and there are others still which will thrive somewhere in between. 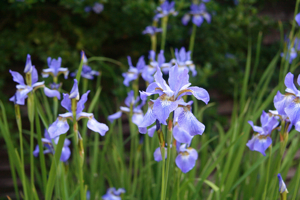 Iris sibirica is one of those – happy in a border with ‘normal’ garden soil (but not dry), or equally happy planted as a marginal plant (at the edge of a pond). 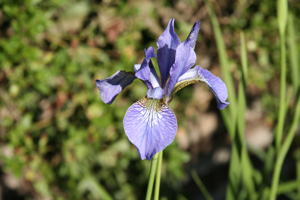 And this Iris will grow in full sun or partial shade, so all in all a very accommodating perennial! I have a few clumps in different areas of my garden (split from one original plant I put in my garden years ago). One area is quite dry, another more moist, but all the plants are thriving. Iris sibirica ‘Tropic Night’ is a real beauty in my opinion. It has very delicate flowers in a gorgeous shade of violet blue with beautiful veined markings on the falls. It will grow into quite a wide clump (about 60-90cm across) over time, and has tall strappy leaves which are an attractive fresh green. (I find it’s worth putting in stakes around the clumps when they reach a good size; as the leaves tend to fall over as the season progresses.) Always a favourite at the Chelsea Flower show, Iris sibirica is one of those plants that looks good in pretty much any scheme – whether you’re aiming for the archetypal cottage garden look, planting around a pond, or designing a more contemporary scheme. This thistle is a cracker! With flowers a beautiful shade of wine red which grow on sturdy stems rising above a clump of slightly prickly, but attractive leaves, it makes quite a statement. It’s a large perennial – the branching flower stems will get up to about 1.2-1.5m high, and it will spread to about 1m across in time. Easy to grow in a sunny position with good soil that doesn’t dry out, it’s also very attractive to bees, so it’s a great plant to use if you’re aiming to encourage wildlife into your garden. Cirsium rivulare ‘Atropurpureum’ will flower for weeks too and although it spreads, it’s not one of those thuggish plants you’re constantly having to dig up and give to your friends (or enemies!). Highly recommended. 🙂 Heading to the local perennial greenhouse today. Do we ever have enough of our beautiful flowers?